Nucleic acids are small biological molecules that are essential to all known forms of life. 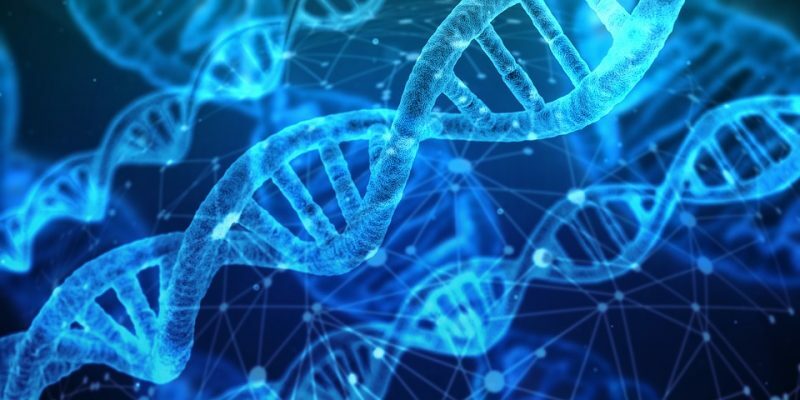 The different kinds of nucleic acids collectively work together to create, encode, and store genetic information and make proteins based on that information. The complex of nucleic acids in your body is like a construction team, where some members give instructions and others put together the materials. Nucleic acids come in two naturally occurring varieties: DNA and RNA. All living cells contain both DNA and RNA. Each kind of nucleic acid performs a particular role in gene expression. Molecules of DNA encode information for constructing proteins; they are like the building blueprint in our construction analogy. RNA molecules function to extract this information out of DNA and physically assemble the proteins. RNA is like the workers who put together the building based on instructions from the blueprint. All nucleic acids share a common core chemical structure. All nucleic acids are linear polymers of nucleotides. 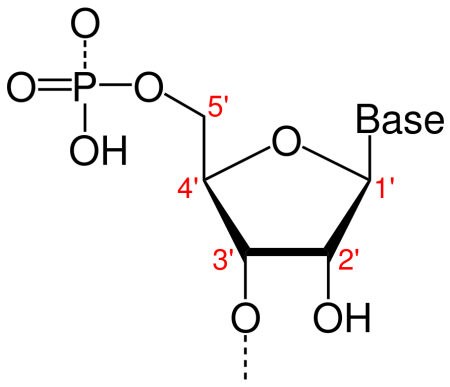 Each individual nucleotide is composed of a nitrogenous base, a 5-carbon sugar, and a phosphate group. The chemical identity of each nucleotide is determined by its nitrogenous base. Genetic information is stored in nucleic acids in the form of a particular sequence of nucleotide bases. Nucleotides are linked together via chemical bonds between their sugar and phosphate groups which forms a sugar-phosphate backbone. Phosphate groups bond to sugars via the 3′ carbon and the 5′ carbon, Which gives nucleic acids a directionality from the 3′ end to the 5′ end. DNA and RNA differ in the structure of the sugar groups in their nucleotides.—DNA has 2′-deoxyribose and RNA has ribose. DNA (deoxyribonucleic acid) are nucleic acids that contain 2′-deoxyribose in their sugar group. A DNA macromolecule is formed by two chains of nucleotides that twist around each other into a double helix shape linked together in the center by pairs of nucleotides One can think of the structure of DNA as a twisting ladder, where the sugar-phosphate backbones form the rails of the ladder and the nucleotide pairs form the rungs. 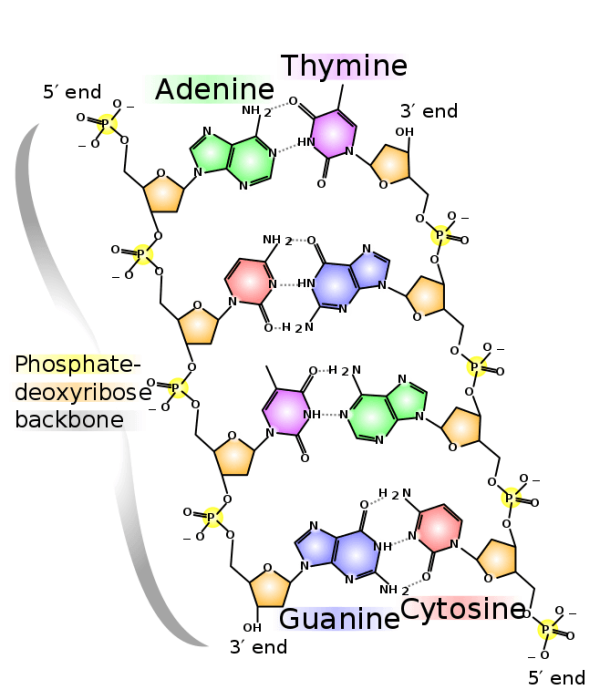 Molecules of DNA contain 4 kinds of nucleotides, adenine (A) cytosine (C), guanine (G) and thymine (T). Adenine and guanine are classified as purines while cytosine and thymine are classified as pyrimidines. Nucleotides join together via complementary base pair conjugation. Each nucleotide has a complementary pair that it forms bonds with. Cytosine and guanine are complementary base pairs (C-G) and adenine and thymine (A-T) are complementary. The double strands of DNA link in the middle by each nucleotide bonding with its complementary base. The particular geometric structure of DNA explains why its nucleotide bases are always in specific proportions to each other; specifically, the amount of adenine is roughly equal to the amount of thymine and the amount of cytosine is about equal to guanine. 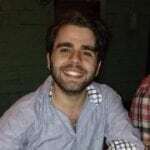 This empirical generalization that there is a 1:1 ratio of pyrimidines and purines in DNA is called Chargaff’s law, named after the Austrian-American biologist Erwin Chargaff who first articulated the principle in the late 1940s. It was not until the 1950s when Francis Crick & James Watson discovered the 3-dimensional geometric structure of DNA that there was a proper explanation for why Chargaff’s law is true. 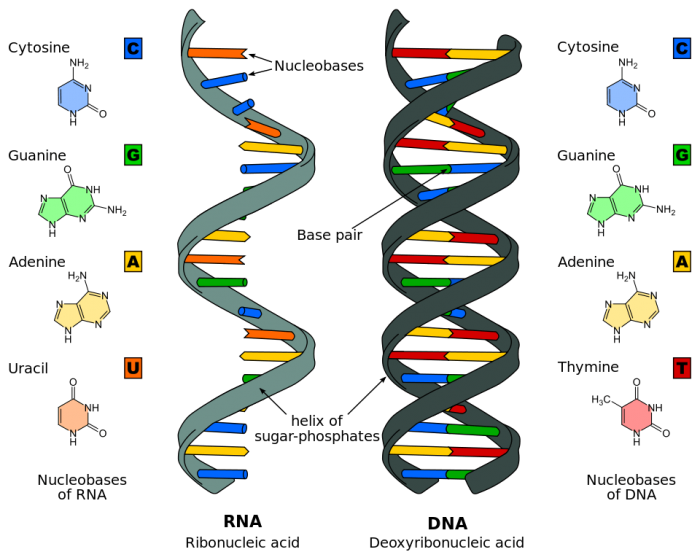 DNA primarily functions to store information used to construct proteins. This information is encoded in the form of sequences of nucleotide bases. Sequences of bases (A, C, G, T) specific sequences of amino acids, the fundamental building blocks of proteins. In simpler terms, DNA contains “instructions” about how to build proteins. Cellular machinery extracts this information out of DNA and constructs proteins according to the instructions. The other main kind of nucleic acid is RNA. RNA (ribonucleic acid) contains ribose in its sugar group. Typically, RNA only comes in single strands, though multiple RNA strands can form molecular complexes. RNA is chemically similar to DNA in that each RNA molecule contains a sequence of nucleotide bases. 3 of the nucleotides in RNA are the same as DNA, A, C, and G. RNA does not contain thymine (T), though, and instead has uracil (U). The main function of RNA is to extract genetic information out of DNA and physically assemble proteins. RNA molecules do two main things in gene expression; they “copy” information from DNA and then “read” that information to build proteins. RNA is more chemically flexible than DNA, which explains why there are more functional variants of RNA than DNA. The different subtypes of RNA are specialized and each performs a specific function in the construction of proteins. mRNA (messenger RNA) is the subtype of RNA that “copies” information in DNA into a readable. The process of copying info from DNA into RNA is called transcription. mRNA is transcribed from DNA via complementary base pairing. During transcription, a special enzyme called RNA-polymerase binds to the specific section of DNA to be transcribed. 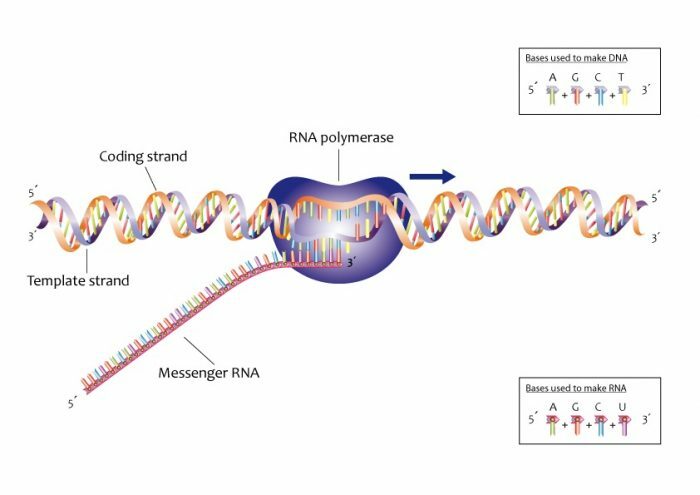 The RNA-polymerase “unwinds” the strand and splits it right down the middle, creating a template strand and a coding strand. One the two strands are split, RNA-polymerase binds to the template strand and begins to “walk” along the strand from the 5′ to the 3′ end. As it goes along, the RNA-polymerase “builds” the mRNA by adding complementary base pairs. The mRNA transcript contains the same information as the coding strand, except all the T bases are replaced with U bases. Once mRNA has been transcribed, it must be read. The process of constructing proteins based on the information in mRNA is called translation. Ribosomes are the cellular complexes where translation occurs. 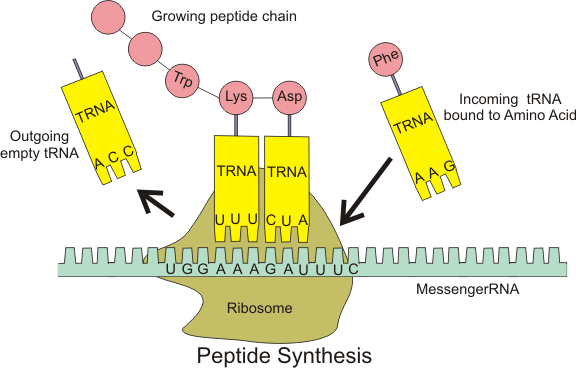 During translation, mRNA is fed through ribosomes which read it sequences of bases to make proteins. Ribosomes are composed mainly out of proteins and rRNA (ribosomal RNA), a special form of RNA necessary for protein synthesis. rRNA forms the main body of the 40S and 60S ribosomal subunits, which are the physical site that mRNA binds to when being translated. Human DNA contains about 300-400 genes that code for rRNA. rRNA is synthesized via transcription of these special genes and is guided by a special enzyme called RNA-polymerase I.
mRNA and rRNA are not the entire story though. tRNA (transfer RNA) molecules are special nucleic acids that serve as the bridge between the mRNA sequence of bases and the completed protein. tRNA are the molecules that actually assemble the protein while it is being processed by the ribosomes. When mRNA is fed through ribosomes, its bases are read in groups of 3. Each group of 3 bases is called a codon. Each codon specifies a particular amino acid. For instance, the codon ‘GAC’ specifies the amino acid glutamine. As each codon is read, a specific molecule of tRNA that contains a complementary anticodon on one end and the specified amino acid on the other end latches on the exposed codon. Once bonded, the mRNA strand is pulled through the ribosome, exposing a new codon that another tRNA molecule bonds to. The two amino acids are then joined together by a peptide bond. this process continues until the ribosome reads a “stop codon,” special codons that signify the end of a polypeptide strand. When a stop codon is read, release factors disconnect the completed protein from the ribosome. snRNA (small nucleic RNA)is a special kind of RNA molecule that is only found in eukaryotes. snRNAs main function it to edit pre-mRNA transcript. In eukaryotes, mRNA cannot immediately be translated after it is transcribed. It must first go through some post-transcription modifications. snRNA binds to the pre-mRNA transcript and cuts out sections of non-coding sequences called introns in a process called RNA splicing. The remaining sequences, called exons, are the sequences that are actually read and translated into proteins. Not very much is known about the evolutionary origin of introns in eukaryotes but they do serve some functions. sequences of mRNA that are spliced out can become micro RNAs that go on to assist in other post-transcription and post-translation mechanisms. Introns also allow for alternative splicing, so you can get more than one product from the same set of nucleotides. To sum up, there are 2 major kinds of nucleic acids: DNA and RNA. DNA contains the genetic information used to construct proteins, while the subtypes of RNA serve to extract this information and build the proteins. There are 4 major kinds of RNA, mRNA, rRNA, tRNA, and snRNA. Thus, there are 5 major kinds of nucleic acids found in the human body; DNA, mRNA, rRNA, tRNA, and snRNA.